There is something about ginger cats that sets them apart from all others. They have a certain kind of attitude, seemingly knowing that they stand out in a crowd. 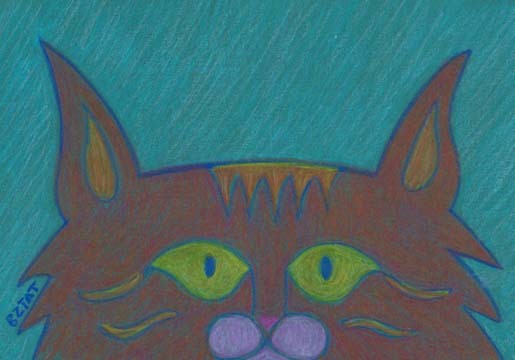 I drew this orange cat drawing a couple of nights ago and posted it on Facebook. Not having my computer set up yet in my new home/studio, I was not able to scan it. The photo that I took with my iPhone made it look a lot different than the original. I set up my computer and scanner today, so I thought I would post the scanned version here. Now you can see what it really looks like. The drawing is for sale for $50 – contact me if you are interested in purchasing it. Do you know a ginger cat with a redhead attitude? I have two gingers actually! Ginger (the older one) is just a big sweetheart, and Travis (the younger one) is still full of kitten energy. He’s always getting into it with someone! Gotta love those gingers! Brew is only half ginger, but he sure is a red hot redhead!